A few HTML elements don’t play nice with responsive layouts. One of these is the good ol’ iframe, which you may need to use when embedding content from external sources such as YouTube. In this article, we’ll show you how to make embedded content responsive using CSS, so that content such as video and calendars resize with the browser’s viewport. Note: This technique was originally detailed in Thierry Koblenz’s excellent tutorial ‘Creating Intrinsic Ratios for Video’. I’ve used techniques I learned from his tutorial and expanded on them here for additional content types such as calendars. Services such as YouTube provide code that you can copy and paste into your own website to embed content. I tend to recommend to my clients that they host video with YouTube because it will save them server space and, regardless of the user’s browser or device, YouTube will display the video correctly. The two main ways to embed video on a website are the HTML5 video element, which doesn’t work in legacy versions of Internet Explorer, and Flash, which doesn’t work on iOS devices and isn’t standards-compliant. However, you’ll notice that our iframe includes width and height attributes. Remove these and the iframe will disappear because it would have no dimensions. And you can’t fix this in your style sheet, unfortunately. The width attribute means that, on a screen narrower than 560 pixels, the embedded content will protrude outside of its containing element, breaking the layout. 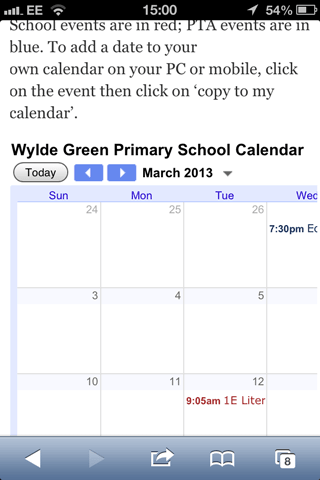 In the example below, I’ve added the code above to a page of my blog. The screenshot is taken from an iPhone in portrait mode (320 pixels wide), and the rest of the page has been shrunk so that the embedded content fits the screen. Far from ideal! Fortunately, there is a way around this using CSS. First, I’ll show you how to do this with embedded video, and then with calendars. The next step is to add styling to this new wrapper and the iframe within it. Setting the position to relative lets us use absolute positioning for the iframe itself, which we’ll get to shortly. The padding-bottom value is calculated out of the aspect ratio of the video. In this case, the aspect ratio is 16:9, which means that the height will be 56.25% of the width. For a video with a 4:3 aspect ratio, we set padding-bottom to 75%. The padding-top value is set to 30 pixels to allow space for the chrome — this is specific to YouTube videos. The height is set to 0 because padding-bottom gives the element the height it needs. We do not set the width because it will automatically resize with the responsive element that contains this div. Setting overflow to hidden ensures that any content protruding outside of this element will be hidden from view. Absolute positioning is used because the containing element has a height of 0. If the iframe were positioned normally, we would have given it a height of 0 as well. The top and left properties position the iframe correctly in the containing element. The width and height properties ensure that the video takes up 100% of the space used by the containing element (which is actually set with padding). Let’s move on to other sources of embedded content — specifically, Google calendars. The CSS to make any form of embedded content responsive is essentially the same, but different content will have different aspect ratios, which means you’ll need to set the padding-bottom value accordingly. 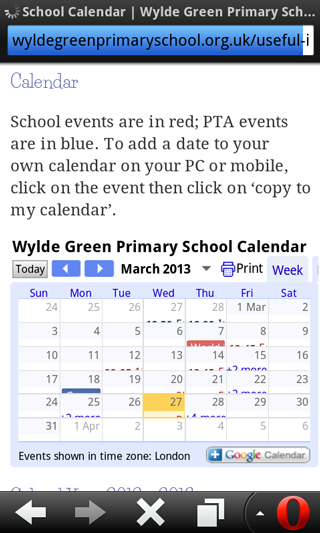 Below is a screenshot of a website that I manage for a primary school, a website that embeds a Google calendar. As you can see, the calendar breaks the layout on a small screen. In this case, the website is displayed at the correct width, but the calendar goes beyond the screen’s width. The next step is to style this div. The CSS for a calendar is almost identical to the CSS for a video, with two exceptions: The aspect ratio will be different, and padding-top isn’t needed. In this case, the iframe is 800 pixels wide and 600 pixels high, which gives us an aspect ratio of 4:3. So, set padding-bottom to be 75%. This is exactly the same styling that we applied to the video. As long as you remember to wrap your embedded calendars and videos with the appropriate containing element, then this CSS will work for any new videos and calendars that you add to your website. The problem, however, is that although you can fit the whole calendar on a page, it’s still almost unusable because click targets are so small and no information is visible. If you absolutely have to display Google Calendar, you can, but if you can use more usable responsive calendar solutions like simple CSS (setting display: block on table rows, for example), or w3widgets Responsive calendar or Calendario for your own calendars, your users might appreciate it. 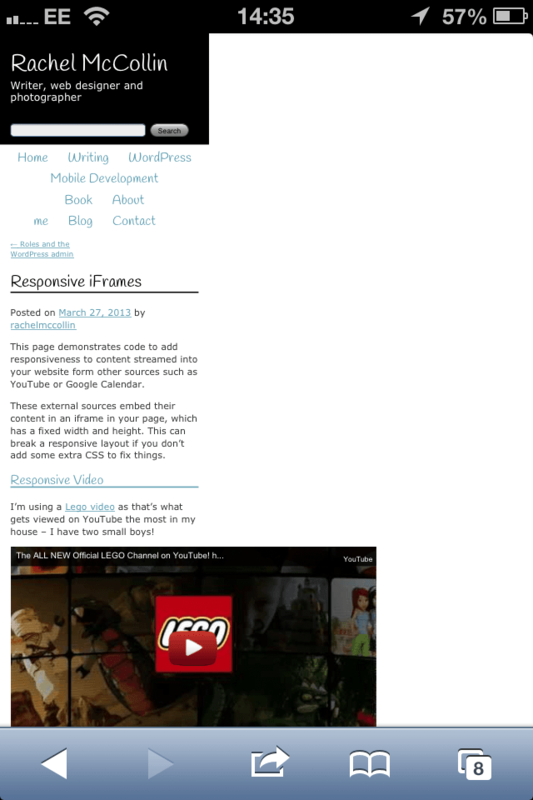 Apart from videos and calendars, another common issue is the embedding of Google maps, responsively. Basically, we again use the same intrinsic ratio technique, and when setting padding-bottom for the wrapper, we just divide the height by width and add the aspect ratio in CSS. Voilá! Again, we can just use EmbedResponsively to generate the copy-paste-code with one click. 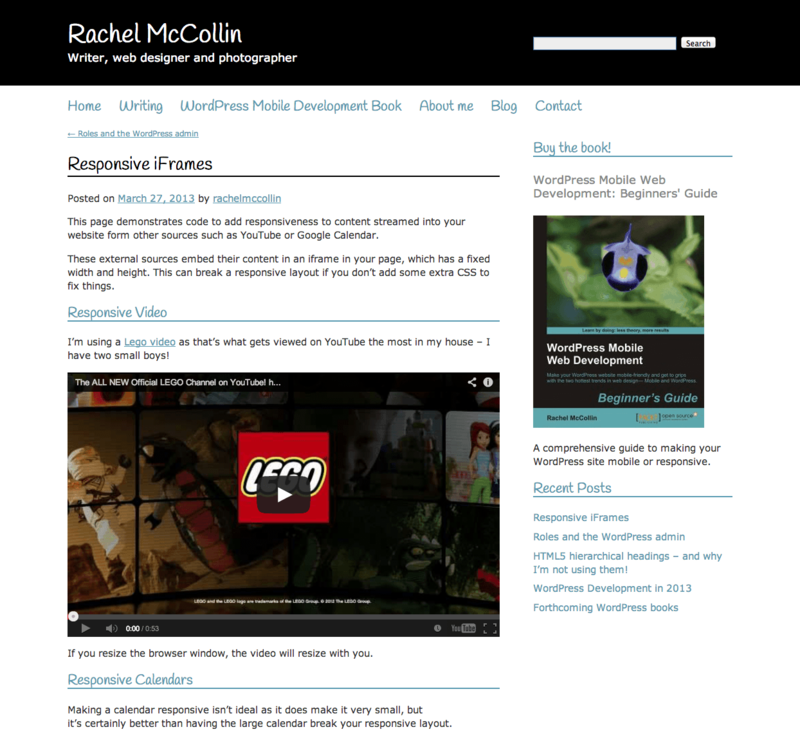 Embedded content has a habit of breaking responsive layouts, because it’s contained in an iframe with a fixed width. In this article, we’ve seen how to add a single containing wrapper, and some CSS, to ensure that all embedded content contained in an iframe resizes with the browser’s window. 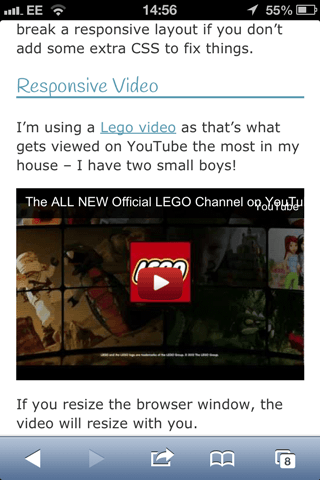 How do you embed third-party content on your responsive websites? Have you discovered any particular tricks or techniques? What does your workflow for embedding such content look like? Front page image credits: Juhan Sonin.